Poorly maintained lawns are more susceptible to damage, so proper lawn care can go a long way to avoiding infestations. An understanding of the life cycle of the pest can help in its management i.e. knowing its susceptible life stages. 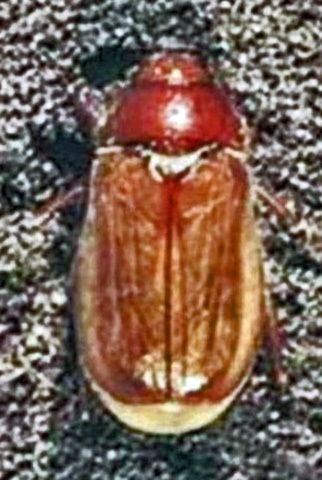 The adult chafer is a brown in colour, and grows to around 12 -15 mm long. It spends the daylight hours buried in the soil, and emerges at night to feed on the foliage of many types of plant but they are generally not a serious problem. The adults mate in early to mid June and lay their eggs then. The eggs begin hatching in late June until mid- July, and the larvae (white grubs) feed throughout the summer and autumn. The white grubs are 'C' shaped and have light brown heads, with three pairs of legs at the head end. They are slightly larger than the adult beetles, growing to around 19mm (¾")long. The general recommendation for controlling the grubs in lawns is to use an insecticide in June / July that will control the tiny grubs as they emerge from their eggs. 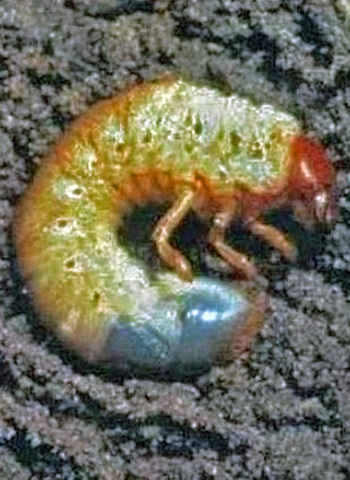 The grubs feed on grass roots, but do not cause significant damage until early autumn and this can be seen as yellowish- brown dead patches of turf. Birds, particularly rooks and crows can often be seen tearing up loosened turf to seek out the grubs. During late autumn and winter as the soil temperatures cools, they move down into the soil to pupate below the frost line. Beneficial nematodes that can be purchased in large garden centres or by mail order can be used to combat the chafer grubs. These are watered into the lawn during the summer to early autumn when the ground is moist and soil temperature range between 12°- 20ºC (55°-68ºC). The nematodes are quite fragile,and require careful handling. Apply them to the affected area as soon possible after purchasing or receit of them. The nematodes are safe to humans, pets and plants, and can kill grubs within 24-48 hours.